He was trying to remember the promise he made to her. nay he was trying to remember her. He was searching frantically and sifting through his diaries as it was his habit to write his every thought there. And there it was, a picture of her, His beautiful Wife who came everyday to meet him in his room.. He wondered why did he forget her, after all it wasn't like him .. he was a genius who remembered everything but not anymore. Then he saw the entry for that day when he made the promise to her. She asked him to promise her that "He will never change." and he answered "I Won't". But he was trying to remember what made him change. Tears rolled down his cheeks as he could not remember at all. He didn't want to change, He Promised not to change .. but he changed none the less. After all Alzheimer slowly changes who you are till you are no longer yourself. P.S. - I am writing after a long time so a small post this time may be make it bigger next time. Love to be back. Interesting nice little writeup...Alzheimer is a sad disease.. Thank you very much Geeta.. All the best for BAT. Hm.. Interesting post. Welcome back to blogging, Vikas. 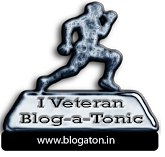 Even I am returning to blogging after a hiatus of 5 months with the return of Blog-a-ton. one word but still cool. . thanks meher.. All the best for BAT-18. Thanks Muddassir Bhai you are welcome all the best for BAT-18. This can be said about almost anyone if you come to think of it. We change when we don't want to and chase change when we it doesn't hit us. Thumbs up for the post. A nice, slow post and loved it! and liked the contradiction between not wanting to change but not having any power over the change! Thank you very much Poli for the wonderful comment. Yeah very true indeed, we all change everyday without having any clue about that. Thank you very much Aashish for the kind comment. Its an art to write such a meaningful post and proved that size does not matter.Great stuff! Sadiya ... Sad but life is not always Happy Tale now is it. Thank you very much for the comment. All the Best for BAT-18. Thank You very much Dr. Pratibha for such a wonderful comment. All the Best for BAT-18. First of all I pray to God that your Doctor is wrong ... and if he is right then lets pray that by that time scientists should have found some cure. Thanks for the comment. All the Best for BAT-18. So very nice. I was expecting something good the moment I clicked you link. And I was not disappointed one bit. Wow..This is one small but very powerful piece..